Moorings: We maintain guest moorings in front of our docks and in Pepperell Cove diagonally across the harbor in Maine. 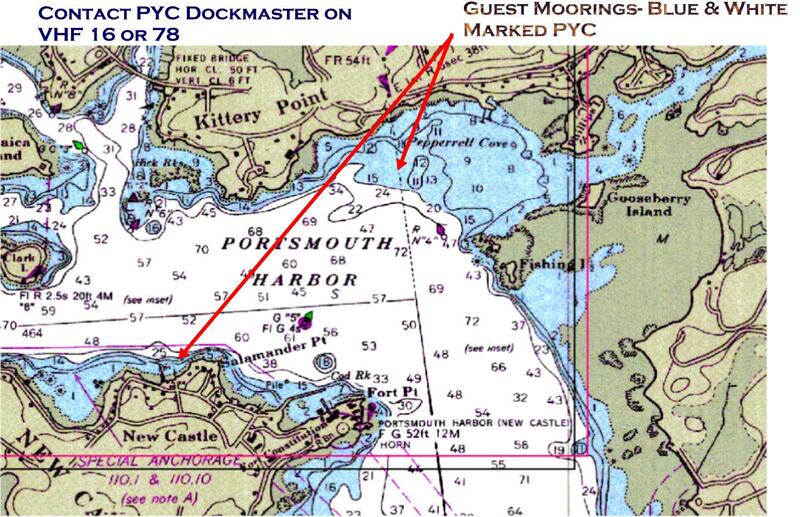 Please refer to the chart shown below for orientation and notional location of the mooring fields. Please contact PYC on Channel 16 or 78A or phone 603 436-9877 to make a reservation. Or send an email to our Steward. PYC club and launch use fee is $32 per night for transient guests staying on PYC moorings. PYC maintains launch service from our facility in New Castle, NH and the Kittery, ME town docks. The fee for this service is covered in the PYC use fee. Should you not be on a PYC mooring and wish to use the launch service the charge will be $10 per round trip for up to six (Qty 6) passengers. The Piscataqua river is known for its fast flow. Yachtsmen wishing to anchor are advised to find a location just outside of the mooring field in Pepperrell Cove between Nun “4” and the Western shore.